Jam-packed with practical examples and techniques, this book will show you exactly how to analyze your own communication for the pitfalls. Specifically, you’ll learn how to shape conversations, presentations, offers, emails, feedback, or customer service to succeed in accomplishing the communication goal—whether to get others to accept change, put aside a bad habit, improve performance, buy your product, or give you the job! Go to WhatMoreCanISayTheBook.com for a longer overview of the book, a Discussion Guide for your team as they read the book and apply its principles, a downloadable grid of the book’s 9 laws, interview questions, an author bio, and downloadable photos. Listen to this interview with Wade Danielson of Entrepreneurs Library for a deep dive into the book What More Can I Say? Booher’s What MORE Can I Say? does say it all in a way that’s relevant, specific, compelling, and credible. Dianna Booher has done it again! What MORE Can I Say is the definitive book on the hows and whys of communicating effectively. I’ve always said leadership is an influence process—and to influence others, you have to know how to get your point across clearly. What more can I say, other than ‘Read this brilliant book! 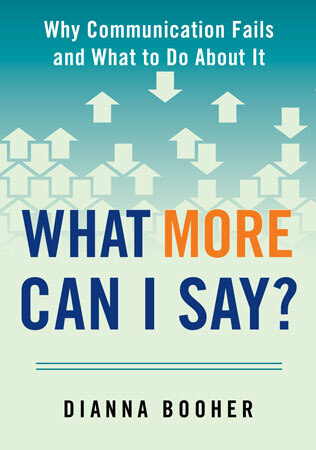 This is a wonderful book, fast-moving and enjoyable, loaded with practical ideas to make you a more influential and powerful communicator. To be a success you need to influence others, communicate persuasively and win the hearts and minds of those around you. Dianna Booher can give you the expert advice you need to succeed. Dianna Booher may have accomplished the impossible. By following the tactics revealed in What MORE Can I Say?, you will communicate in a way that creates a dynamic engagement with others after which all parties walk away satisfied and smiling. Excellent work from one of today’s most important communication experts. ….It’s hard to imagine anyone would have to search long for places to apply the author’s advice. Who wouldn’t want to communicate effectively or understand how they are persuaded? Verdict: Useful and precise, this guide explains how to turn communication failures into communication successes in a variety of situations. This book is perfect for entrepreneurs who are trying to become credible public figures and need practical advice that helps them overcome the typical failures of communication.